Today I will attempt to give an overview of the Folk Costumes of Germany. 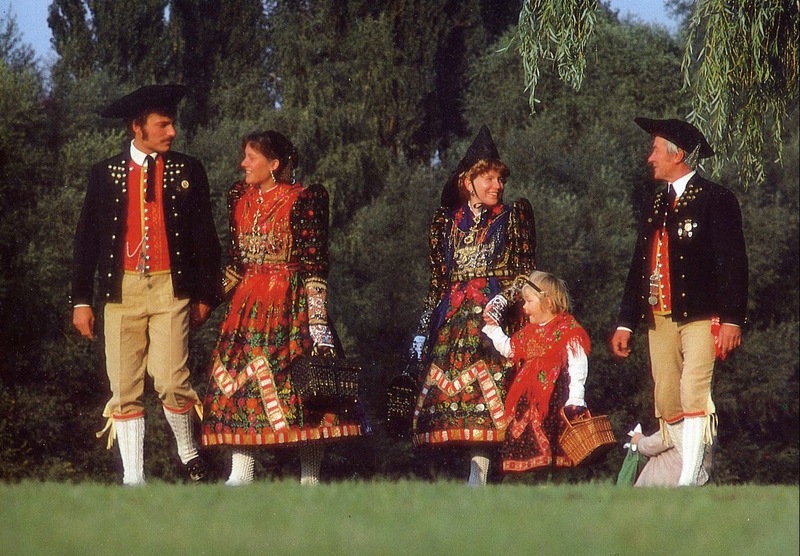 As in many parts of Western Europe, the survival of Folk costume in Germany is very spotty. 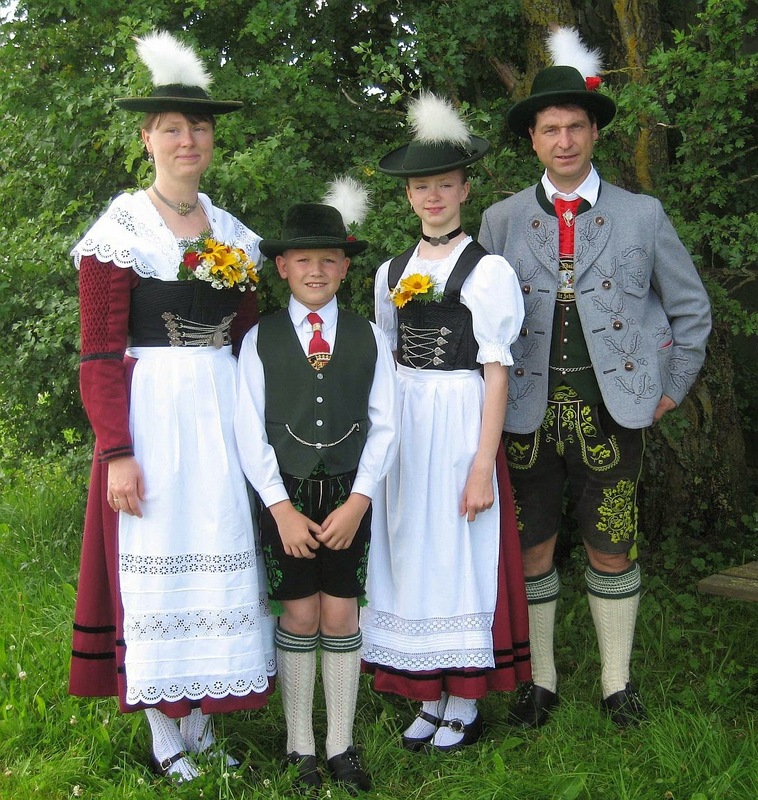 The image above is the costume of Miesbach in Upper Bavaria, which is what usually comes to mind when one thinks of Germany. There are a great variety of other costumes. I will try to show one costume from each of the Regierungs Bezirke, the mid level administrative districts of Germany. This will give a broad survey of the nation. Here is a map of the States, followed by a map of the Regierungs Bezirken. I will proceed roughly north to south. 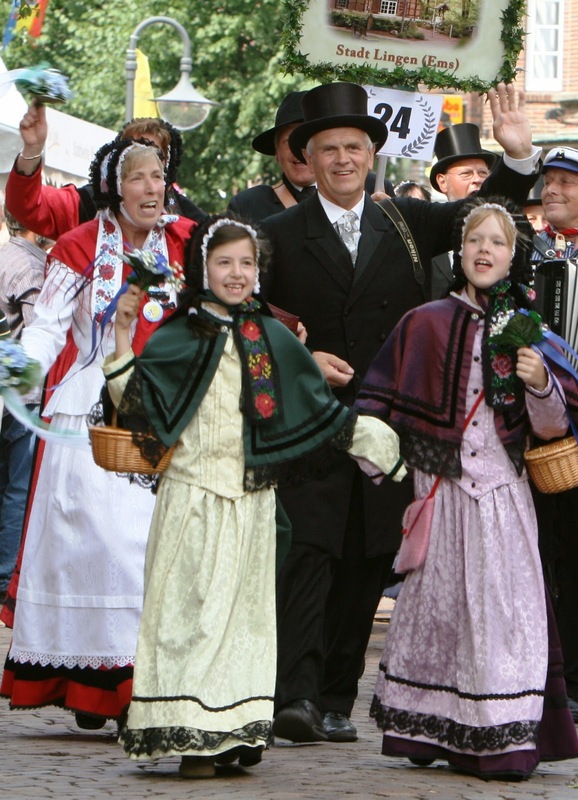 I will also omit the costumes of ethnic minorities, such as the Frisians and the Sorbs.You will note that dirndls will not be in evidence. Dirndls developed in the 20th century from traditional everyday attire, and while they are a folk costume, they are not regional. Some of them are very beautiful, some practical, and others very tacky and schlocky, or downright slutty. There is a place for them, but I will show here the traditional more dressy attire. Also note that this is far from exhaustive, some regions have many more costumes. This State is not subdivided into districts, but historically, the north part is Schleswig, and the south is Holstein, the traditional border being the Eider River. 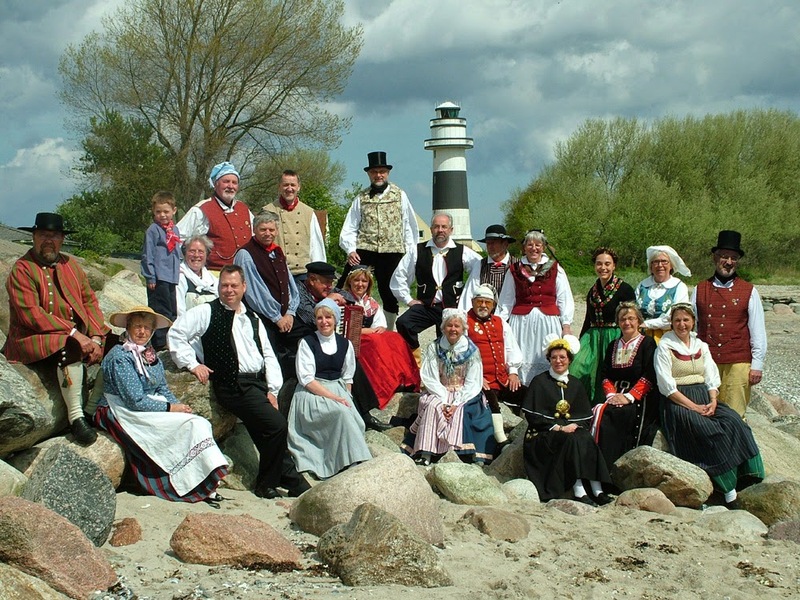 Most of the population speaks German today, but many of the people of Schleswig are of Danish or Frisian origin, and many in the east of Holstein are of Slavic [Wendish] origin. 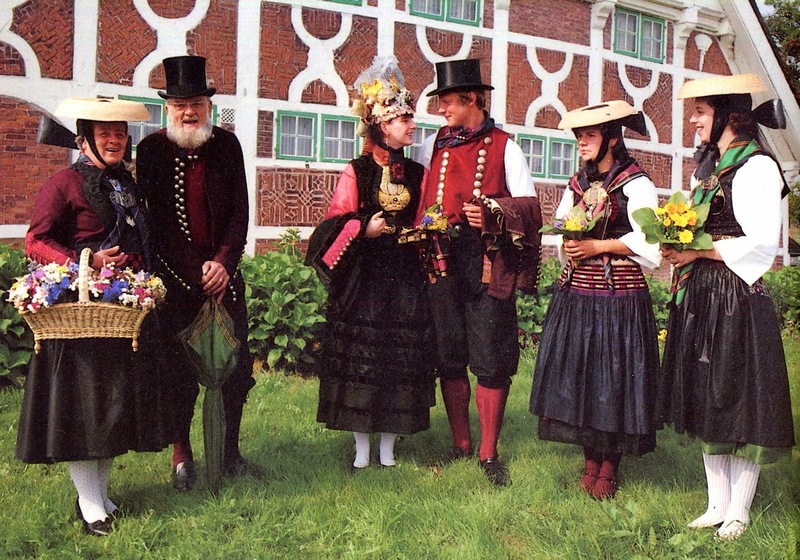 This photo shows a variety of the costumes of Schleswig. This group is from Probstei, by Shoenberg. The city of Hamburg is geographically within Holstein, but has the status of a State within Germany. 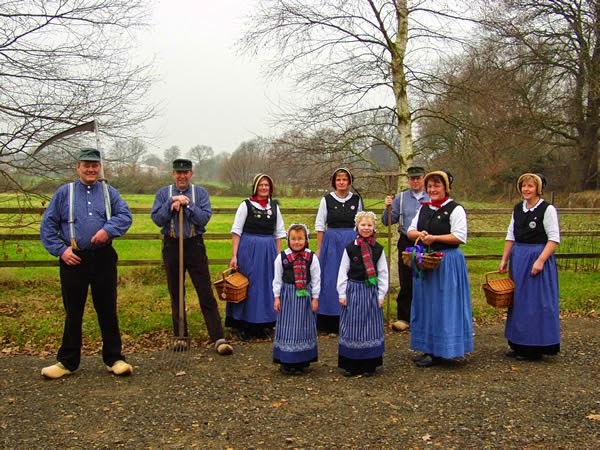 There is a very well maintained folk costume in the district of the Vierlande, which lies within its borders. 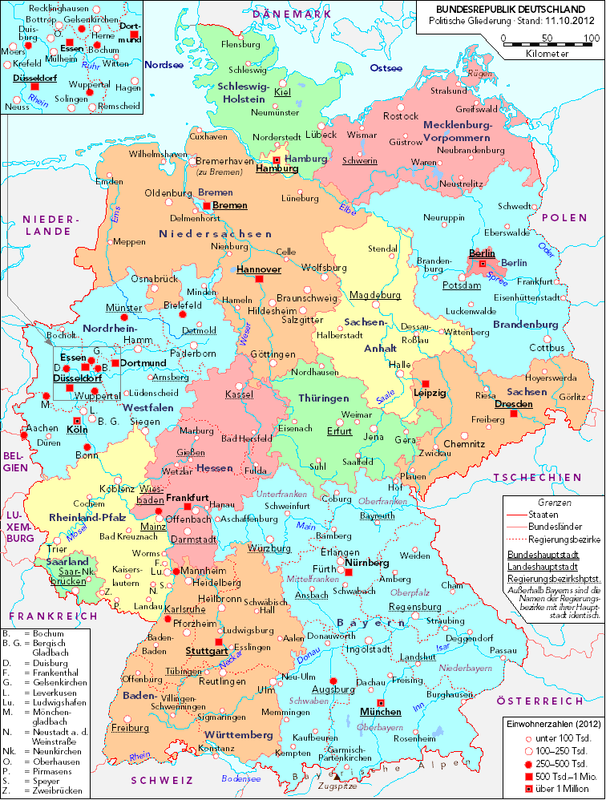 This State is also not divided into districts, but is historically made up of Mecklenburg, which comprises the western two thirds of the State, and Vorpommern, or Cispomerania, which lies in the east. 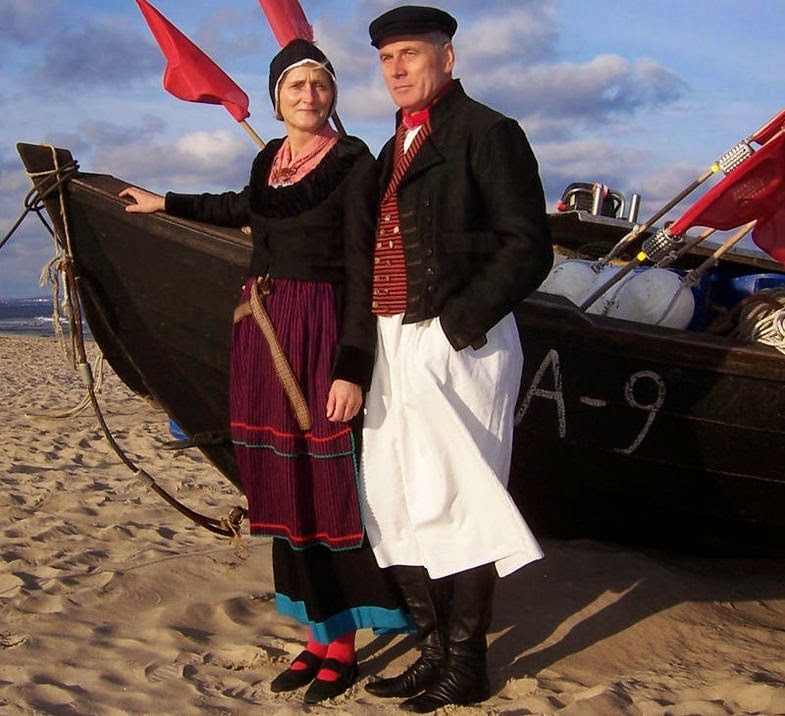 This is the costume of Moenchgut, on the island of Ruegen. The population of this state are a mix of Germans, this being the heart of the Germanic Prussian Empire, and Slavs [Wends], who have mixed in this region since the 10th cent. 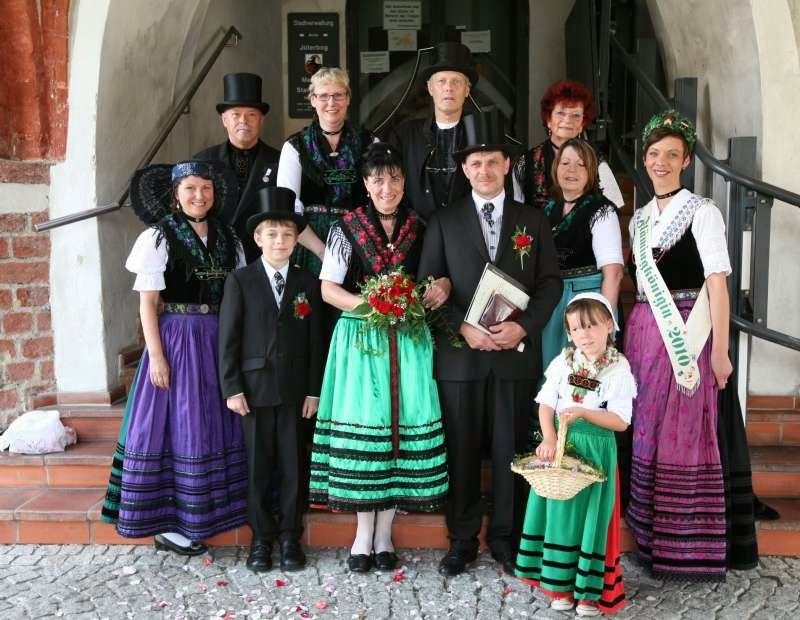 Most of the Folk costumes which are seen in this region are Sorbian. This costume is from the village of Dennewitz and is known as the Flaeming tracht. Berlin is completely surrounded by the State of Brandenburg. I do not believe that the city has any folk costume tradition. This translates as Saxony, or Upper Saxony, and is found in the southeast corner of the present borders of Germany. 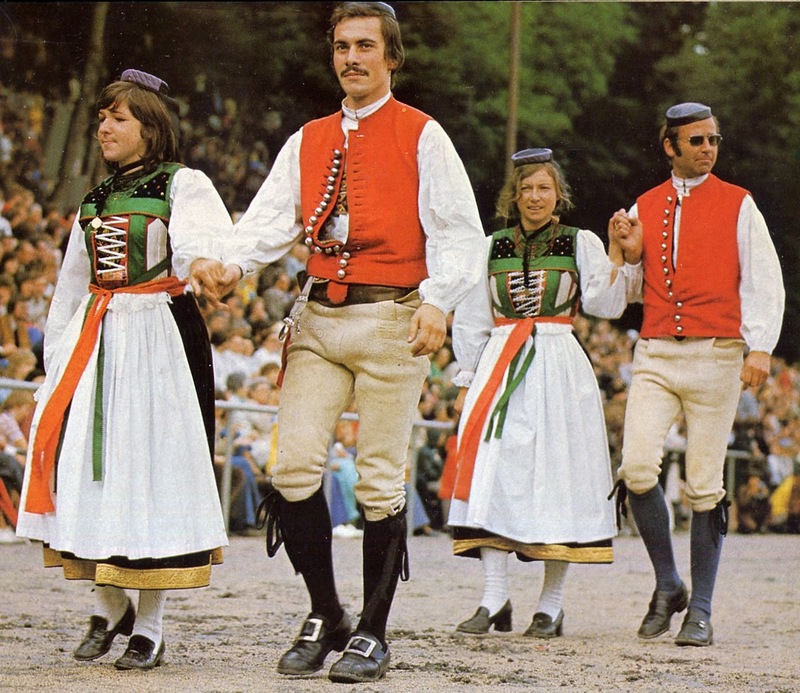 Many of the folk costumes of this State are Sorbian. Here is an Upper Saxon costume from around Dresden. This translates as Saxony-Anhalt, and lies between the states of Saxony [Upper Saxony], and Lower Saxony. This group is from the Harz. 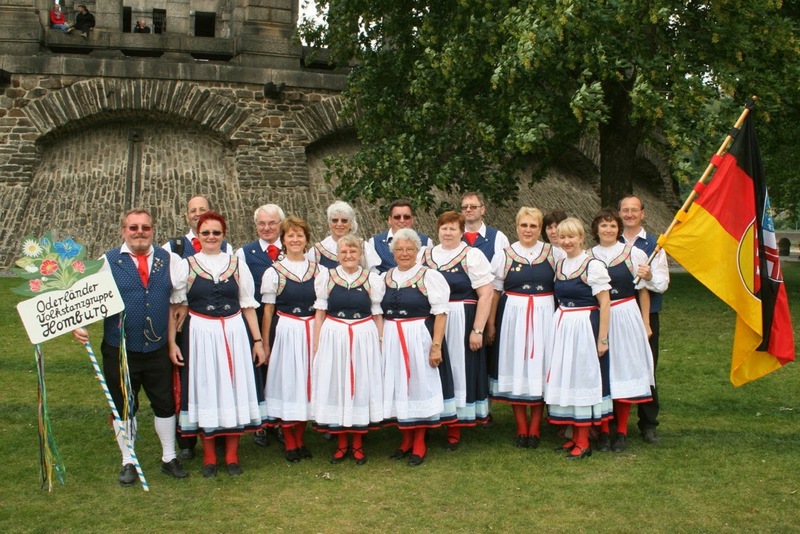 This group is from Salzwedel in the north. Lower Saxony, this lies in the northwest corner of Germany. It is today divided into four Bezirke, Lueneburg, Hanover, Braunschweig, and Weser-Ems. Here is one extremely well maintained costume of this area, from Scheessel. 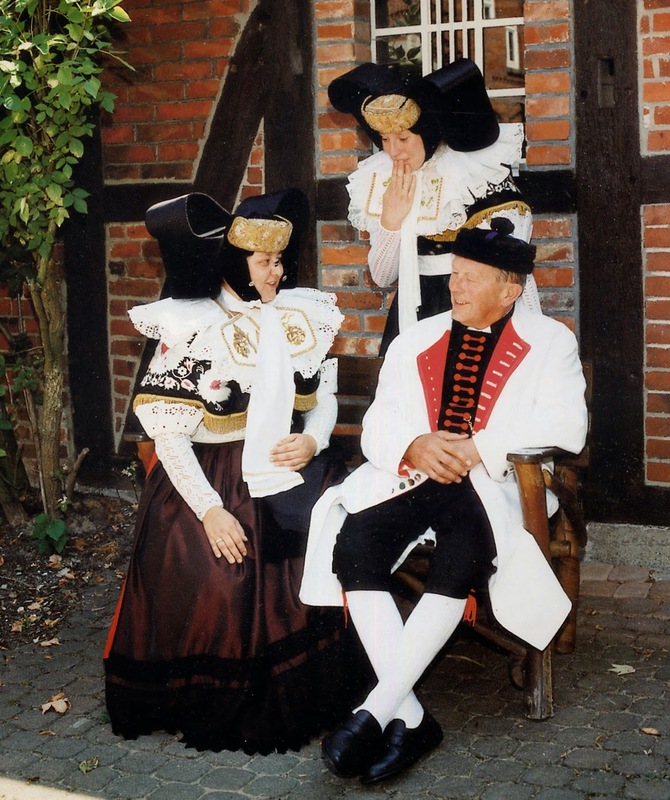 One of the most famous and spectacular costumes of this area is that of Buekeburg in Schaumburg. This costume is from the town of Lingen in Emsland. The famous city of Bremen forms its own City-State in two non contiguous districts, Bremen and Bremen-Port. This is the home of the Hessians. It lies in central Germany The three Bezirke divide Hesse into northern, central and southern regions. This costume is from the Schwalm, which is the location of the famous German Fairy Tale Rotkäppchen, which literally means 'Little Red Cap', which you can see in the photo. For some strange reason, this is usually translated into English as 'Little Red Riding Hood'. In fact, she did not wear a hood, but a little red cap like this. This costume is from Marburg. This couple is from Odenwald. This state combines the historic region of Westphalia in the north with the northern part of the Rhineland in the south. 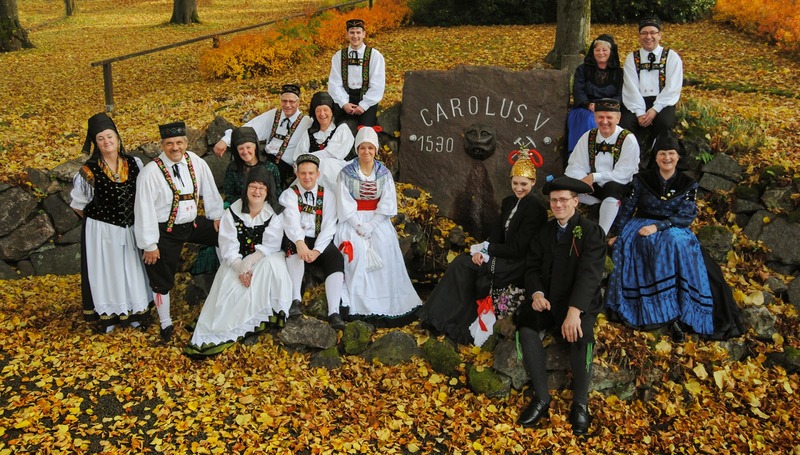 This is the most populous part of Germany, and there is little that is remembered of Folk Costume.This group is from Elsdorf. This is often translated as Rhineland-Palatinate. This northern part of this State consists of the southern part of the Rhineland. The southern part consists of the Pfaltz found along the Rhine which was formerly a non-contiguous part of the Kingdom of Bavaria.. It is found in central Western Germany, along the French border. This costume is from Winningen on the Mosel. This costume is from Hassloch. This lies in the corner of Germany that borders Lorraine. This group is from the town of Homburg. This lies in the southwest corner of Germany and consists of the historic regions of Baden and Wuerttemberg, or Schwabia.Baden is a relatively narrow region on the west of this area, and Wuerttemberg comprises the eastern two thirds. This costume is from the area known as Hanauerland. 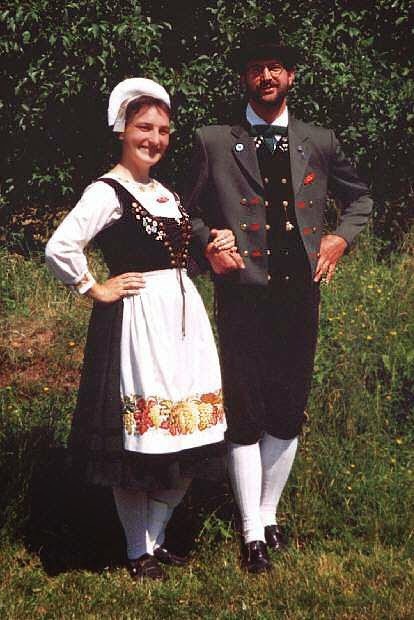 The similarities to the costume of the neighboring region of Alsace are obvious. 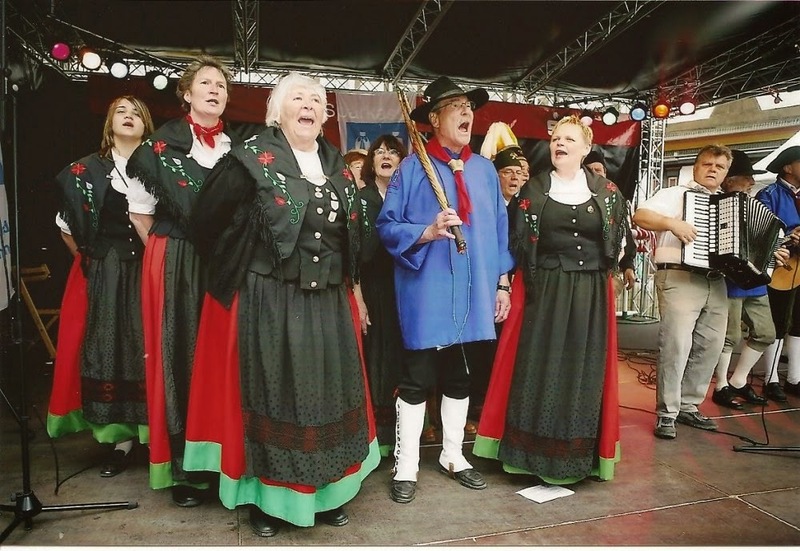 This group is from the village of Furtwangen in the Black Forest. This is the Betzingen costume. This costume is from the region of WestAllgäu, near the Bodensee. 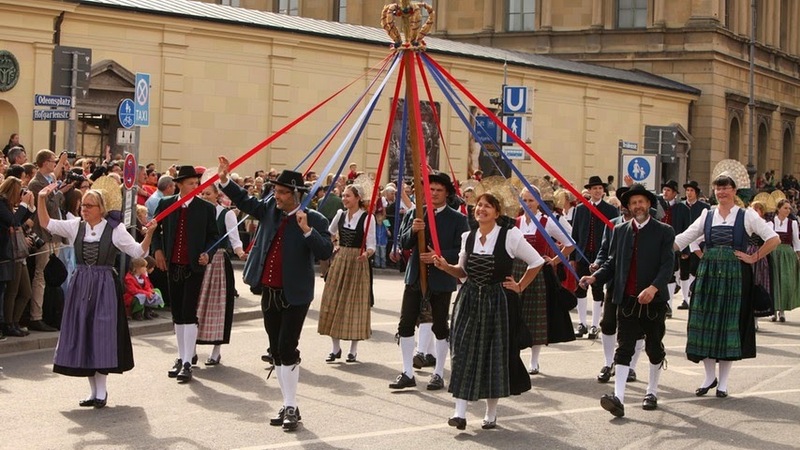 It has much in common with Austrian and Swiss costumes just over the border, including the famous radhaube [wheel headdress]. Bavaria, in the south of Germany, the largest State. It consists of Upper Bavaria, Lower Bavaria, The eastern part of Schwabia, and Franconia. 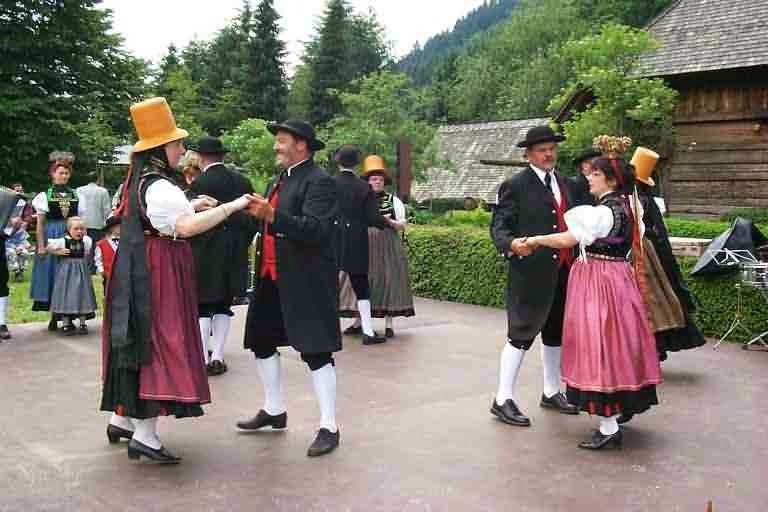 This costume is from Oberstdorf in Bavarian Swabia. This costume is from Schwabach. This costume is from Ochsenfurt in Lower Franconia. 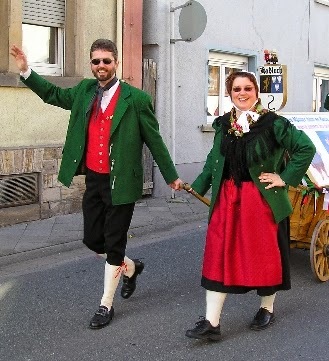 This costume is from Effeltrich in Upper Franconia. Sometimes translated as The Upper Palatinate, this is in the east of the State of Bavaria between Bavaria proper and Franconia. This costume is from Parsberg. This costume is from the Vils valley in Lower Bavaria. 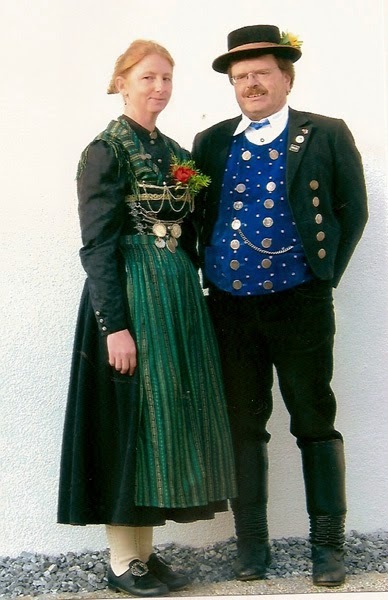 Upper Bavaria, the region which is best known for the Miesbach costume, which I featured at the head of the article. Here is a lesser-known costume from the Lech-Ammersee area. This concludes this article. There are, of course, many more costumes within Germany, both German and non-German. There are also many German costumes from outside Germany, as there are or were many German colonies scattered as far east as the Volga. Much of this is from the websites of various local groups in Germany. Maria Reiners, 'Unsere Tracht', Potsdam, 1930's? thank you roman. 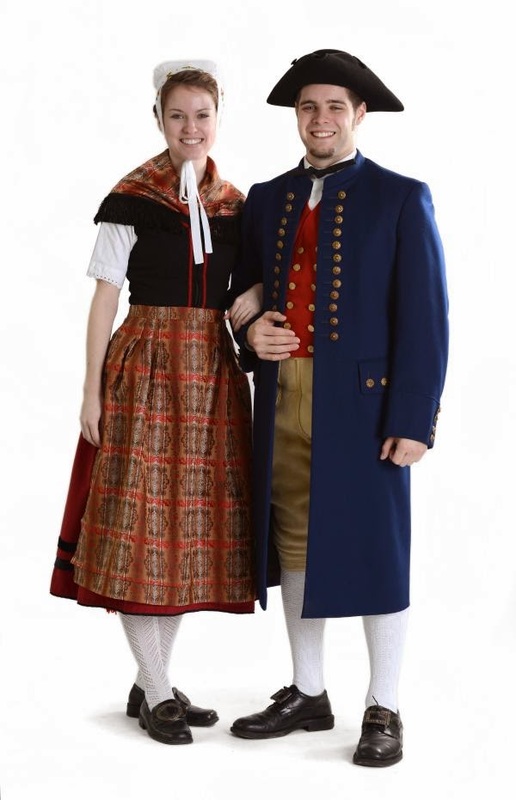 i´v been searching for "tracht" in my region saxonia since years, but all i could found is the slavic sorbian or bohemian costume. in the museum in dresden they have some dresses from the 19.cent. 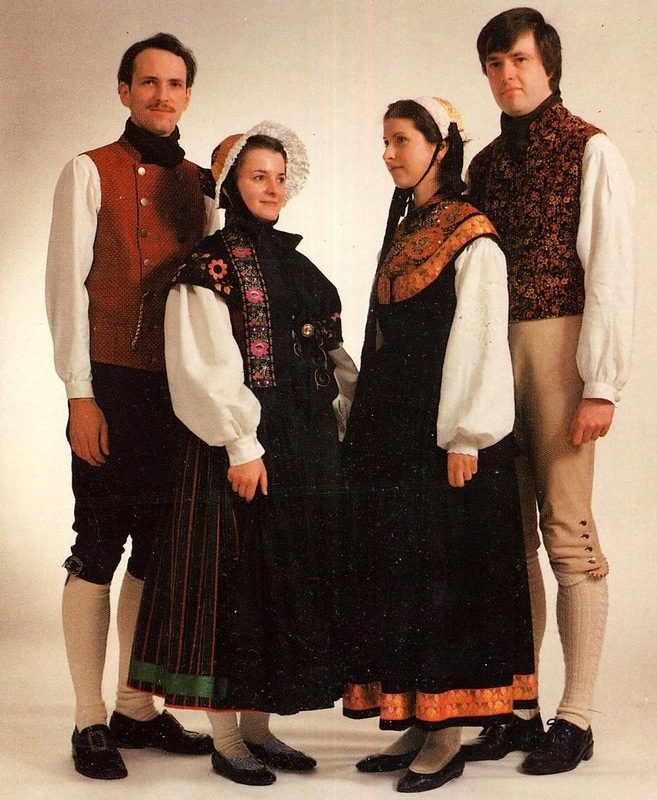 - but they´r more typical period fashion then folk costume. how can this be? why is there a whole region without a tracht?? any suggestions? Hello K. Roman, I loved your blog. It is very detailed with rich information. 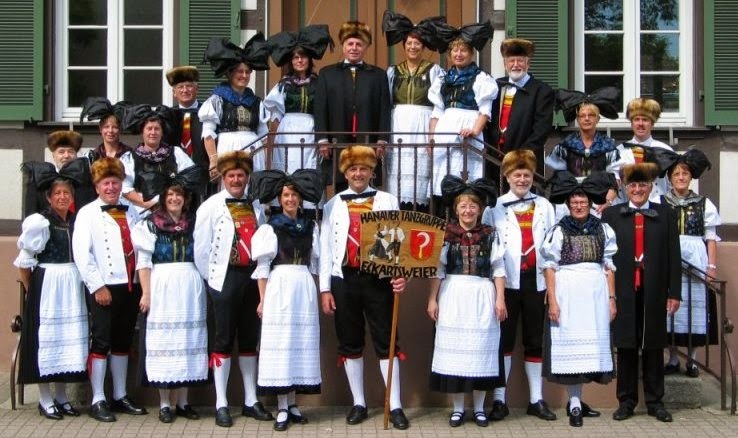 I am Geovane Westrup, Volkstanzgruppe Immerfroh dancer City Forquilhinha, state of Santa Catarina - Brazil, and would like to learn more about the tracht Winningen on the Mosel and in Oberstdorf Bavarian Swabia. I will be very grateful if you make a page on the blog explaining about these costumes. Hallo Roman K., liebte ich einen Blog. Es ist sehr reich mit Informationen beschrieben. Ich bin Geovane Westrup, Volkstanzgruppe Immerfroh Tänzerin Stadt Forquilhinha, Bundesstaat Santa Catarina - Brasilien, und möchte mehr über die tracht Winningen an der Mosel und in Oberstdorf Schwaben lernen. Ich werde sehr dankbar, wenn Sie eine Seite auf dem Blog zu erklären über diese Kostüme machen. Olá K. Roman, adorei seu blog. Ele é muito detalhado com informações ricas. Eu Sou Geovane Westrup, dançarino do Immerfroh Volkstanzgruppe da cidade de Forquilhinha, estado de Santa Catarina - Brasil, e gostaria de conhecer um pouco mais sobre os tracht de Winningen no Mosel e de Oberstdorf em Suábia da Baviera. Ficarei muito grato se fizer uma página no blog explicando sobre estes trajes. Finally! 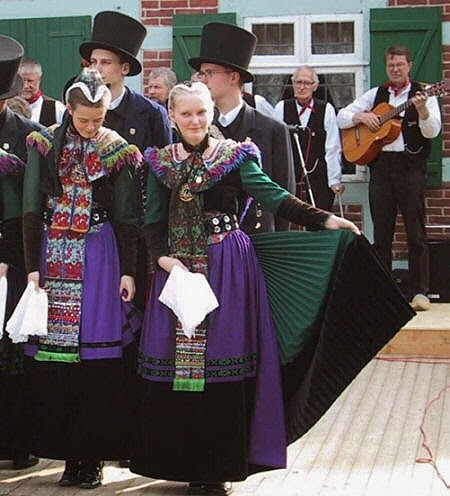 Someone who doesn't deny that traditional costumes existed in Nordrhine-Westfalien. My relatives there just GI e you the equivalent of a deer-in- headlights response when I've asked about this. 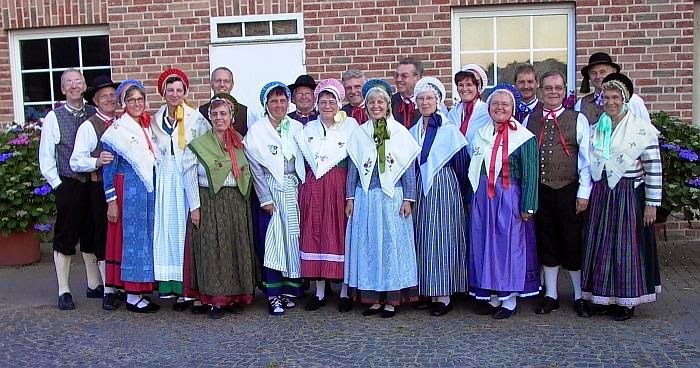 I sing in a German American choir here in Evansville, and I would love to wear a costume like that my ancestors wore, instead of Bavarian traditions, but can't get a clue as to what they wore. You'd think they went straight from caveman furs to modern western dress in northern Germany, to hear my relatives respond to my inquiries on the subject of ethnic dress in the area my Dad came from. Dress has developed everywhere, but some areas, especially large munipalities, never really developed a distinct costume of their own. City costume has always been different from that of the villages. City costume is what one sees in the general history of costume. The region that you mention is one of great industrialization and city influences. The costumes of this region look little different from general 17th century clothing. 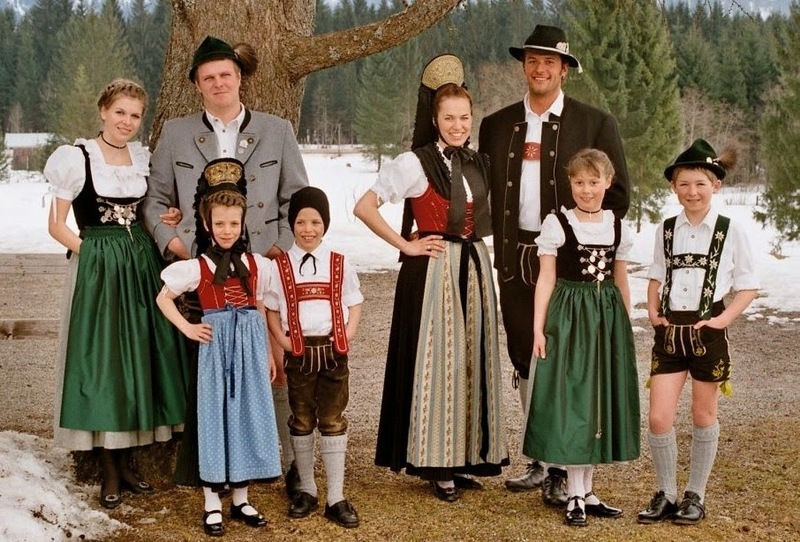 It is also true that many modern Germans have little to no cognizance of the tracht traditions of their area. I would recommend doing searches of Tracht and Trachtengruppe in the general area. It is very likely that you will find something from not too far away. Good luck to you. Which are are you looking for? Wo sind doe Kostueme fuer die Schwarzwaldgegend? Die Frauenhuete mit den grossen roten Kugeln? Ich war sehr ueberrascht, dass diese hier nicht gezeigt werden. Does anybody know a source where one can buy such costumes? If you do, would you please respond herin a comment? Thank you. Wo sind denn die Schwartzwälder Kostüme? 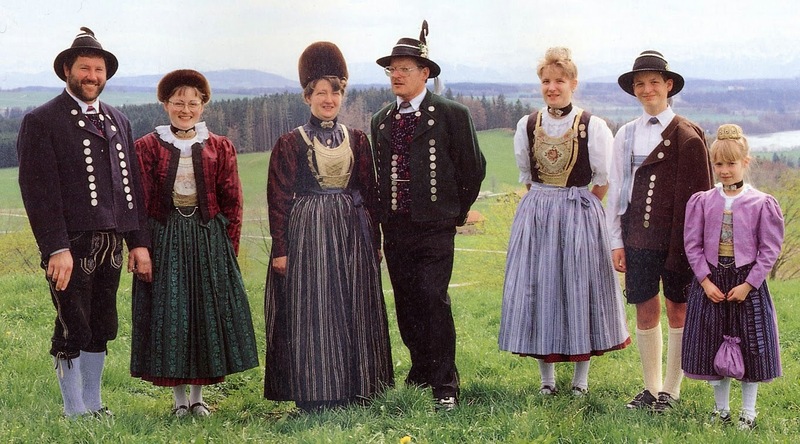 These are not all the tracht of Germany. Schwarzwald in particular has many trachten. 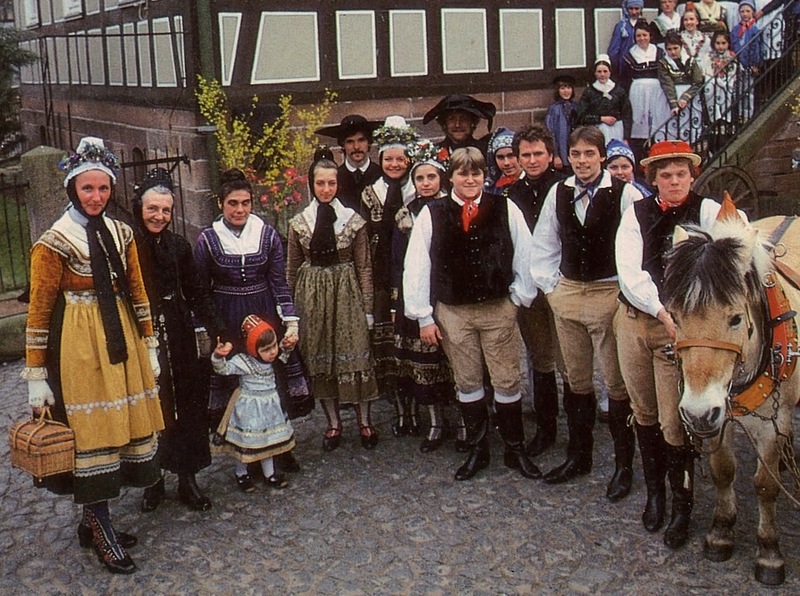 The famous tracht with the bollenhuete was only worn in the area around Gutach. I chose to present a different Schwarzwaelder costume in this article. You do have a point, but this distinction is not as clear in English, and in many languages the term costume is very neutral. There is definitely a difference between traditional attire and dress up costumes. "Costume" was used before about the 1920's or so in the same way that present-day English speakers use the word "outfit". 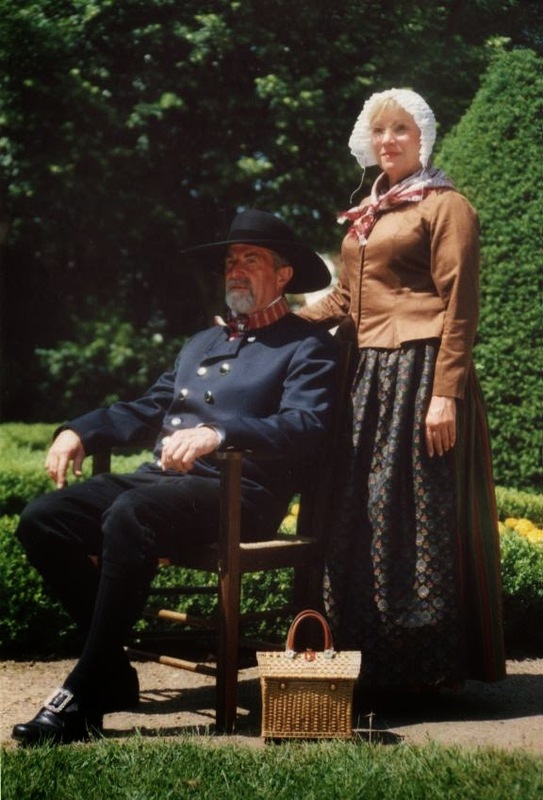 In any case, "costume" is the standard word used in the study of historical clothing. Roman used the term correctly. This is really wonderful. I traveled extensively in Germany when I was a costume supervisor for the musical, "42nd Street". I would love to see what was worn in the Stuttgart area where my German relatives are from. When I was in Stuttgart, I was busy tracking down information about a Zimtwafeleisen that my Great Great Grandparents brought over when the immigrated to Ohio. Do you think you will be adding to this in the future. When I left, my crew in Berlin gave me a great book called "Trachten Skizzenbuch" as a going away gift, but it does cover that region either. Do you think you will be adding to this? Haha wow. My ancestors came from the Stuttgart area and settled in Ohio too (Columbiana County). They likely came over well before your great-great-grandparents, but that's still interesting. They evidently really liked northeastern Ohio (for some reason) because their cousins were still coming to join them decades later. I'm not sure what you know about Heiden, It is found in Borken district, Muensterland, Westphalia. This puts it right at the edge of Low Germany, not far from MIddle Germany. This areahad lost its Tracht already by the end of the 19th cent. I have found no indication that Heiden has a Trachtengruppe, but you might try that. I do have a book about Westphalian tracht, but not a whole lot from this particular area. I did manage to find a few old photos online as well. The most important part of the costume is the haube, or bonnet, of which there were apparantly three types, one for everyday, and two different styles for going out or going to church. The rest is relatively standard for west europe, there would be a chemise, blouse, petticoat, ankle length skirt, apron, spencer jacket, and shawl. The bonnet is either made of silk and lace with lots of gathers and smocking, or it has gold embroidery on the back, with a simpler construction. Do you do sewing or embroidery yourself? How formal an outfit do you want? Look at the image of the costume of Westphalia above. It will look much like that. Yes! I did study your picture from Westphalia, since you mention it was taken near Muenster, which is very close to Heiden. The two things I noticed that seemed to be unique to that area were the white embroidered shawls and the bonnets for the ladies. The men's clothing seemed a bit more standard, though the long, skinny ribbon ties may be more unique to that region - not sure. My overall impression is that they seem about right, knowing my ancestry as a do. The trachten felt more rural in appearance, and my family comes from farming stock - dairy farming specifically. It was a way of life passed down through the generations once they settled here, until the last couple. I do sew and embroider, but alas don't have much time for either these days outside of mending. I'll get in touch via email. Love this post! Perfect for my research project on German culture! Ok, maybe I am just looking at the wrong place, so please feel free to correct me. I didn't seem to see any outfits closer to areas bordering The Netherlands. My mom has done our family history and our German lineage traces to what we can loosely figure as German Dutch. Basically, my ansestors lived very close to the border of Germany and The Netherlands that the border changed a few times. Although all records are in German, I've had to do quite a lot of translation. I would like to make a nice outfit for myself that represents my heritage. Where I live there is a very large German American population so the local Germanfest is huge. Any help would be greatly appreciated. I would be glad to look, You would be talking about Lower Saxony, most likely. What is the exact area that your family came from? I'm thinking that is right, my mom has all the records and she is getting back to me with the exact area. 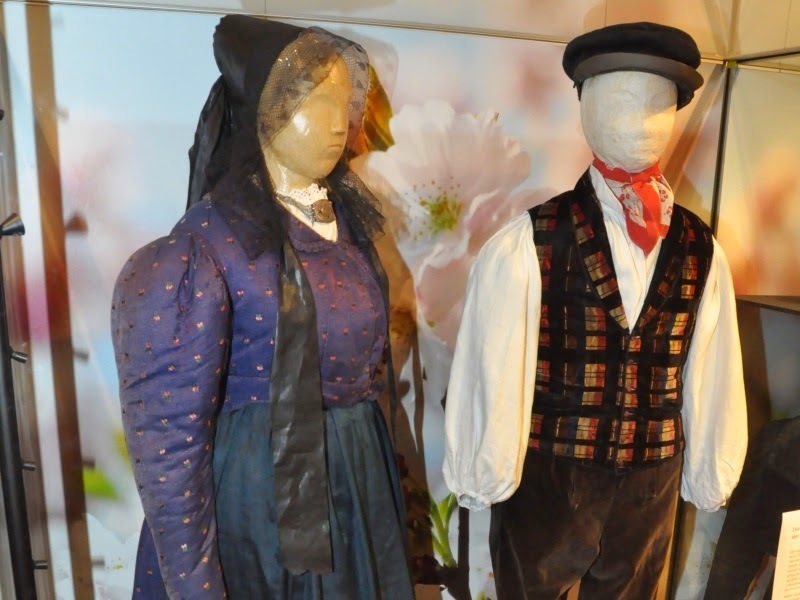 Seeing the photo from Unterfranken makes me smile and reminisce about seeing these beautiful clothes my Oma had packed in a chest in our tiny village of Ettleben. When she passed they were donated to a local historical society. Thank you for your research and efforts. Hello Roman, Do you have any other photos/depictions of Prussian traditional clothing. I am a second generation here in the states. My grandfather emigrated from Germany and I've been told our heritage is Prussian. Wondering if there is anything in addition to what appears to be a very formal black apparel. Prussian costume is difficult to trace. They were a Baltic people, related to the Lithuanians. After the Teutonic Knights and The Hanseatic league settled in their territory, they were assimilated by the Germans. Some of these Germans began to call themselves Prussian, even though the Prussian language had died out. The German Empire at some point began to call itself Prussia, and at the turn of the 20th century, consisted of a great deal of present day Germany, Poland, part of Lithuania, etc. What is left of East Prussia was annexed by Russia, which holds it to this day. It would be good to find out exactly what they mean by 'Prussian', and find out which area your family was from. There are a few costume traditions from East Prussia that have survived,in present day Poland and Lithuania, but nothing contemporary from the Russian occupied part. There was also a new costume of the dirndl type designed in the 1930s for East Prussia. I thank you for that information. I truly enjoy your site. 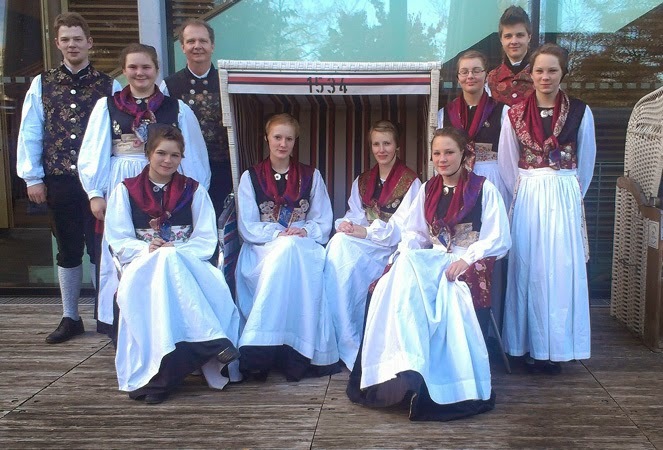 Page dedicated to promote traditional dresses of europe. do you know where I can buy some of these? 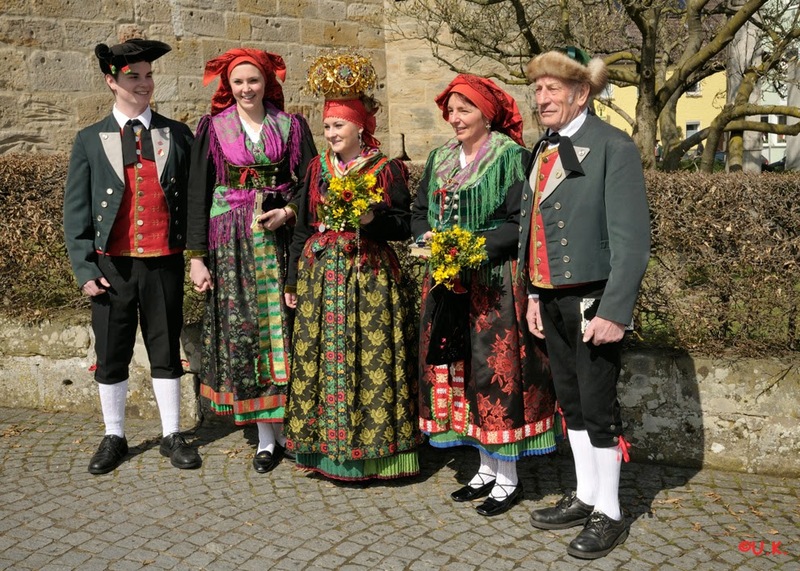 What is the traditional dress for the area around Eibelshausen?